A good pod set up is a must have for all vapers, we need them for those times where our hectic schedules have us running all over the place and needing a vaping solution that will be able to stay compact and easy to be able to use no matter what. 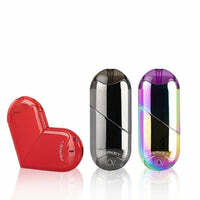 So beautiful in design, you can transform this mod from a typical pen shaped pod mod to being in a cute heart shape that will allow you to let your aesthetic preferences shine. Along with its gorgeous appearance, this pod kit has really user friendly functionality. Perkey makes some of the most creative and interesting pieces of hardware that are going to have you standing apart from all of your fellow vapers. The Lov Pod Kit has a 1.6ml juice capacity, a 10 watt maximum wattage output, a bottom refill system and a draw activated firing mechanism.